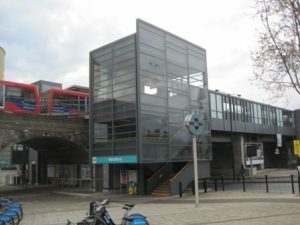 Westferry Station is in the eastern part of the Limehouse area named after the lime kilns which used to manufacture pottery for the ships in the docks. It was also London’s first Chinatown and notorious for its gambling parlours and opium dens. The area was run down, but it benefited from the regeneration of docklands in the 1980s and is now quite trendy. Westferry Station is very close to Canary Wharf, and a short walk east alongside the blue cycle path and then right onto Hertsmere Road will take you to the Museum of London Docklands in about 8 minutes. On your right on Hertsmere Road you will pass The Dockmasters House, this listed 3 storey Georgian building is home to an excellent Indian restaurant of the same name. 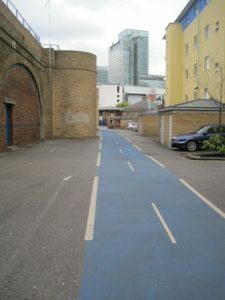 A 14 minute walk from Westferry Station along Limehouse Causeway and then Narrow Street (follow the blue cycle path west after leaving the station) takes you to the Limehouse Basin which is the starting point of both the Regent’s Canalwhich heads west through North London, and the Limehouse Cut canal which heads towards Three Mills near the Olympic Site. On its way to Limehouse Basin, Narrow Street passes several historic riverside warehouses and also The Grapes public house which features in Dickens’s Our Mutual Friend and has a renowned fish restaurant upstairs. At the mouth of Limehouse Basin is Gordon Ramsay’s gastro-pub The Narrow. A turning to the right about 3 minutes into this route is Three Colts Street which leads to the maritime church of St Anne’s Limehouse (9 minutes from the station), designed by Nicholas Hawksmoor in the 18th century and Grade I listed it flies the White Ensign from its flagpole (a flag normally only flown by the Royal Navy) and has the highest church clock in London.